A view of the PJM control room. A view of the PJM control room. The grid operator, based outside Philadelphia is the nation’s largest. 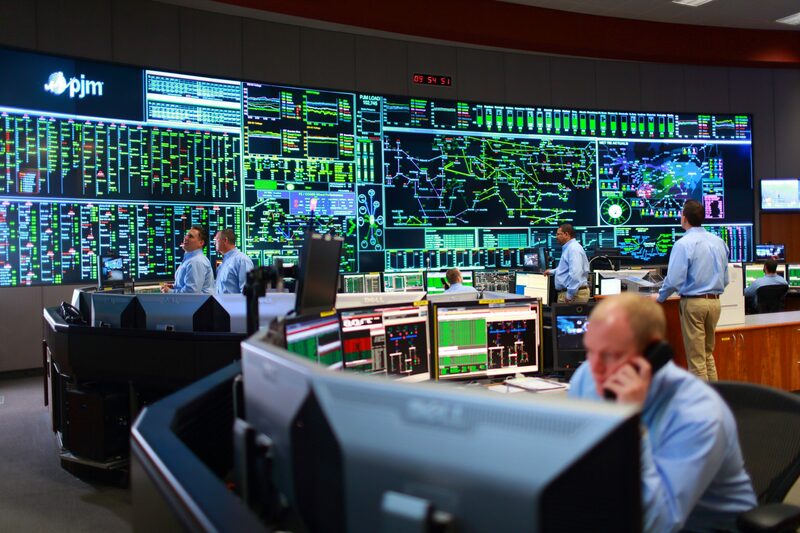 The joint alert from the FBI and Department of Homeland Security last month warning that Russia was hacking into critical U.S. energy infrastructure came as no surprise to the nation’s largest grid operator, PJM Interconnection. PJM is the regional transmission organization for 65 million people, covering 13 states, including Pennsylvania, and Washington D.C.
On a rainy day in early April, about 10 people were working inside PJM’s main control center, outside Philadelphia, closely monitoring floor-to-ceiling digital displays showing real-time information from the electric power sector throughout PJM’s territory in the mid-Atlantic and parts of the midwest. Donnie Bielak, a reliability engineering manager, was overseeing things from his office, perched one floor up. But the industry certainly did take notice in late 2015 and early 2016, when hackers successfully disrupted power to the Ukrainian grid. The outages lasted a few hours and affected about 225,000 customers. It was the first publicly-known case of a cyber attack causing major disruptions to a power grid. It was widely blamed on Russia. One of the many lessons of the Ukraine attacks was a reminder to people who work on critical infrastructure to keep an eye out for odd communications. O’Brien doesn’t want to get into specifics about how PJM deals with cyber threats. But one common way to limit exposure is by having separate systems: For example, industrial controls in a power plant are not connected to corporate business networks. Since 2011, North American grid operators and government agencies have also done large, security exercises every two years. Thousands of people practice how they’d respond to a coordinated physical or cyber event. So far, nothing like that has happened in the U.S. It’s possible, but not likely, according to Robert M. Lee, a former military intelligence analyst, who runs the industrial cybersecurity firm Dragos. For example, he said, it would very difficult for hackers to knock out power to the entire east coast for a long time. But briefly disrupting a major city is easier. That’s the sort of thing that keeps him up at night. “I worry about an adversary getting into, maybe, Washington D.C.’s portion of the grid, taking down power for 30 minutes,” he said. The Department of Energy is trying to create a new office focused on cybersecurity and emergency response. Deterrence may be one reason why there has not yet been a major attack on the U.S. grid, said John MacWilliams, a former senior DOE official who’s now a fellow at Columbia University’s Center on Global Energy Policy. In the meantime, small-scale incidents keep happening. This spring, another cyber attack targeted natural gas pipelines. Four companies shut down their computer systems, just in case, but they say no service was disrupted.